Our efforts to continually upgrade our complex communications infrastructure requires a dedicated team of individuals. A lead player in organizing, planning, and carrying out many of our projects is Rob Hitt, other-wise known as ATC’s “Executive Excavator”. Rob has been with ATC since 1996, where he originally began as a combination technician in our Albion area. Having perfected the skill set of a heavy equipment operator, Rob enjoys the work of expanding our infrastructure, and takes pleasure in working alongside the great people in our communities. Rob spends his free time chasing his kids on motorbikes and at rodeos, and enjoys the relaxation that only Pepsi and pizza can bring. 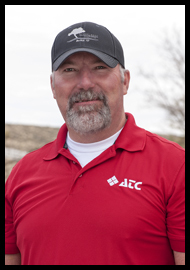 ATC is proud to have this soft-hearted, puppy-lovin’ guy as the captain of our Construction Management team.